State Secretary and Deputy Defense Minister Nikolay Pankov probably didn’t surprise a lot of people when he announced the latest Defense Ministry flip (or flop this time?) on the military police issue last week. But he didn’t elaborate on the Defense Ministry’s reasons for stopping or suspending the effort at this moment. Military police units are, or were, supposed to stand up in 2010. Their mission was to maintain order and discipline, and prevent hazing and other barracks violence and crime, primarily thefts of military property. A military police department started working in the Defense Ministry’s Main Combat Training and Troop Service Directorate last December, drawing up plans and training programs for the new MP units. In early February, a Defense Ministry representative denied press reports that Defense Minister Serdyukov had suspended work on the military police force. But a source in the Defense Ministry’s press service told the media that “the documents establishing it have been sent to the appropriate legal directorates for reworking.” He said that forming the military police would require amendments in federal legislation beyond the Defense Minister’s purview. The back-and-forth, on-and-off nature of Russia’s yet-to-be created military police calls into question the Defense Ministry’s capacity to formulate and implement policies, or at least to do it so its doesn’t look foolish. Why would any military district commander or brigade chief of staff hurry to introduce any new policy or regulation that might just be overturned 6 months from now, or never implemented at all? As with the rumored halt in February, the latest stop may in fact be related to legal issues, but they usually only become an obstacle when they’re really protecting someone’s bureaucratic empire. In this case, the military prosecutor and MVD are obviously very interested parties when it comes to devising a military police policy. And they are pretty big hitters vis-à-vis the Defense Ministry. The Defense Ministry already has plenty of people and organizations involved in military law enforcement, but they seem unable or unwilling to organize and cooperate to do the job. Existing military law enforcement mechanisms could be made to work properly. Another sticking point may continue to be who will be in charge of a new military police force. The prosecutor and MVD probably don’t want military police to answer to the Defense Ministry. Military commanders could misuse or corrupt military police who would be enforcing laws on those commanders as well as ordinary servicemen. From the get-go, Tsyganok was against spending a ‘not small’ amount of money on a new structure seen as a panacea for all the army’s ills, at a time when the existing military command structure should be able to handle military police functions. Tsyganok kind of skirts around the issue without saying so, but it may be there’s not enough money to pay for building a military police force. Babich goes on to note that it’s still unclear what’s happening with Russia’s 85 permanent readiness combined arms brigades that replaced divisions in the Ground Troops. Main Military Prosecutor (GVP) Sergey Fridinskiy observed last week that it will only be possible to deal with corruption when not just the law enforcement organs, but also responsible officials in the military command hierarchy become involved in fighting it. At last week’s coordinating conference on fighting corruption in the armed forces and other armed formations, Fridinskiy reported that, in January and February, military corruption cases increased by 10 percent over year ago figures, and material losses to the state in those first months of 2010 were 5 times greater than in 2009. Inflation and an increased volume of arms purchases were cited as contributing to the spike. In 2009, corruption cases increased 5 percent in military units. Fraud and forgery cases increased 50 percent, but misappropriation, embezzlement, bribery, misuse, and abuse of authority also grew. Recall, of course, that the Defense Ministry claimed it had a major anticorruption drive in progress this winter. Maybe these are some of the results. Attendees at GVP conference included representatives of the Federation Council, Duma, Military Collegium of the RF Supreme Court, Military-Investigative Directorate of the RF Prosecutor’s Investigative Committee, Ministry of Defense, MVD’s Main Command of Internal Troops, Ministry of Emergency Situations, and the FSB’s Border Service and Department [once Directorate?] of Military Counterintelligence. Chief of the GVP’s Oversight Directorate Aleksandr Nikitin repeated an earlier publicized statistic on a 16 percent reduction in military crime last year. Nikitin credited widespread GVP preventative measures for the decline in crime. He also noted the induction of more conscripts with higher education and supplementary performance pay for commanders as positive factors. According to him, with the extra money, young commanders have started to pay more attention to ensuring order in their units. Nikitin also says the overwhelming majority of the country’s military units generally function without crime or other incidents. An Interfaks reporter has interviewed Main Military Prosecutor (GVP) Sergey Fridinskiy for the pages of today’s Izvestiya. Not surprisingly, Fridinskiy didn’t really bite when asked if the GVP had any hand in the recent Defense Ministry cadre ‘revolution.’ He said the GVP keeps its hands on its part [i.e. law enforcement]. Fridinskiy says the GVP monitored the implementation of the ‘new profile.’ In some places, it went more or less normally, but in others, it got out of hand and there were mass violations of servicemen’s rights, like putting 600 men in a barracks for 300. So the prosecutor reacts to such a situation. Fridinskiy said the GVP gave quarterly reports on violations to the Defense Minister. Asked about the military’s involvement in the tragic ‘Lame Horse’ club fire in Perm, Fridinskiy said the chief and chief engineer of the KECh which was responsible for the property were aware of what was going on there and might have been getting a cut, but the fact that they allowed gross fire safety violations resulting in a tragedy with many victims is what resulted in the investigation and criminal case against them. He indicated the KECh chief died in the fire, and they are investigating whether the chief engineer got bribes. Fridinskiy noted other responsible military officials in the district got disciplinary punishment. On the ‘Steppe’ garrison boiler house case, Fridinskiy revealed that state inspectors looked at it in May or June and declared it unfit for use, but the locals did cosmetic repairs and used it anyway. He says other districts and garrisons, especially Kostroma, are being inspected. He believes old equipment is largely to blame, but it’s up to the GVP to force people to do their jobs and not let the situation reach the point of an accident. Fridinskiy termed the general crime situation in the armed forces as stable, with some favorable points. Registered offenses were down 16 percent in 2009 against the year before. The numbers of grievous and especially grievous crimes were down. These figures were for all uniformed power ministries, not just the armed forces. Dedovshchina looked like it would continue a significant decline, but actually ended up increasing by 2 percent. Fridinskiy claims that in the group of ‘barracks hooligans’ in the Kaliningrad garrison there were both North Caucasians and Slavs [but were they part of the same group or in different groups?]. He said 8 were charged in the incident, and some have already been convicted. Asked about crime among higher officers, Fridinskiy says malfeasance, exceeding authority, and fraud were the biggest offenses. Eight generals [probably from all power ministries] were convicted and six got prison terms from 3 to 5 years. He said the theft of state money was greatest in the GOZ, RDT&E, and housing programs. He indicates he’s investigating 8 cases where apartments didn’t get built by the SU-155 construction firm, despite the fact there were state contracts in place for them. Fridinskiy seems to indicate he registered 1,500 crimes among senior officers in 2009 [as of late October, he had this number at a little less than 900]. As for how to fix the crime situation in the military, Fridinskiy doesn’t offer much advice beyond using the law. Of course, that gives him lots of business. On 10 January, Interfaks-AVN reported that the Defense Ministry has sent the federal budget a fraction of an expected 10 billion rubles in proceeds from sales of its property in 2009, according to a Federation Council committee source. 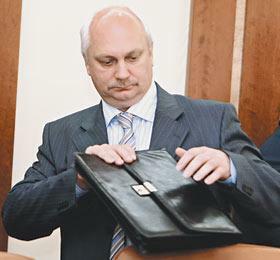 The Audit Chamber expected 10.6 billion rubles, but only 1.5 billon has been forwarded to the budget. The income was supposed to come from the sale of vacant land, unused property, and excess equipment. So, either the sales did not produce the anticipated profits or corruption in the Defense Ministry drained them away. The source said there was accurate accounting of what was to be sold, and what should be gained from the sales, and so there’s an obvious temptation to steal. It doesn’t because pretty early on Defense Minister Serdyukov won a battle to keep this right inside his department. Nezavisimaya gazeta’s Vladimir Mukhin picked up on this story yesterday. He concludes right off that Serdyukov’s ambitious plans to profit from unused Defense Ministry property turned into a fiasco. He notes the Defense Ministry hasn’t made a secret of this, saying on its auction site that more than half of planned auctions didn’t occur because of the lack of applications to participate. Mukhin quotes Aleksandr Kanshin, chairman of the Public Chamber’s veterans, servicemen, and families committee, saying the unmet plan for selling excess military property (VVI) is more or less connected with last year’s economic crisis, but from the other side, it’s not really the Defense Ministry’s business to be salesman for state property, and military men have no experience, personnel, or resources for this. Another interlocutor says there have been significant instances of corruption arising in the sale of VVI. Simultaneously, the Defense Ministry’s Personnel Inspectorate and the Main Military Prosecutor (GVP) have launched a widespread anticorruption inspection under orders from Serdyukov. The inspection covers Defense Ministry directorates, the armed services, branches, military districts, and fleets. A law enforcement source told Interfaks the inspection aims to prevent crimes by officers and generals and will continue until 1 March. The source said corruption and other offenses by several generals and senior officers had already been uncovered, and the central attestation commission might relieve them of their duties. Offenses were noted in the VVS, VDV, Railroad Troops, and Ground Troops. More than 40 percent of offenses by officers involved the theft of property or funds, and crime by senior officers is rising. The GVP reported damages to the state from military corruption exceeded 2.5 billion rubles. Krasnaya zvezda’s interview with the MVO military prosecutor is quite astounding. He says he’s been implementing the national anticorruption plan since 2008, using an interdepartmental group, including “state security organ employees in the troops” [FSB officers] and command representatives. So, in 2009, prosecutors and FSB officers investigated 190 cases. Based on these, they gave commands 200 reports leading to disciplinary action against more than 300 “responsible parties.” More than 130 investigations were directed to the “military-investigative organs” [the military section of the Investigative Committee or SK]. More than 100 criminal corruption cases were developed. He credits the system of coordination among the “organs” involved. But corruption sometimes has a very organized character. He cites the loss of 128 million rubles to a corruption ring of officers from the Defense Ministry’s “central apparatus,” the apartment management directorate and staff of the MVO who stole and sold 140 vehicles and pieces of equipment in 2005-2008. Mukhin gives some attention to the GVP’s figures too. He adds that the GVP uncovered 1,500 corruption crimes in the ‘power’ ministries as a whole in 2009. Every other case was either aggravated, or especially aggravated. In 70 percent of cases, officers were the culprits. In the GVP, they say that dishonest military commanders are making a fortune on auctions and contract bidding. Mukhin then reminds everyone that it was Prime Minister Putin who, in late 2008, gave the Defense Ministry the right to handle its own VVI, rather than the Federal Agency for the Management of State Property. Commenting for Grani.ru, Vladimir Temnyy also blames Putin for letting the Defense Ministry run these auctions. The first thing Serdyukov intended was to inventory and get rid of noncore property and functions which lead generals to embezzle state funds, but this has apparently happened anyway since 9 billion rubles are missing. So why wasn’t somebody like Serdyukov, as everyone expected, able to pull off a successful process of shedding VVI and benefiting the state. Two reasons–the crisis and theft by his subordinates surpassing all conceivable limits. Could the reformer become a victim of his own trust in his people? The state won’t get the money back anyway because it’s already gone into fabulous suburban homes occupied by modest colonels and generals, according to Temnyy. So the sale of VVI has raised military living standards after all, at least for some. Recall also that Nikolay Poroskov said one source told him the recent command changes weren’t just about age and rotations, a third reason was the results of the personnel [and GVP?] inspection above. Also, there’s the talk about devising a new “officer’s honor code.” Certainly, it will prohibit corruption. Can’t be a coincidence.